Ian Burn began investigating the act of looking in the mid 1960s. In this work, text across a standard framed mirror quotes from the 18th-century Scottish philosopher David Hume. The original quote continues, ‘if we consider these objects in themselves, and never look beyond the ideas which we form of them’. The viewer is asked to consider this specific work of art without considering his or her accumulated knowledge and assumptions about either ‘mirrors’ or ‘works of art’ (or the person ‘in’ the mirror). 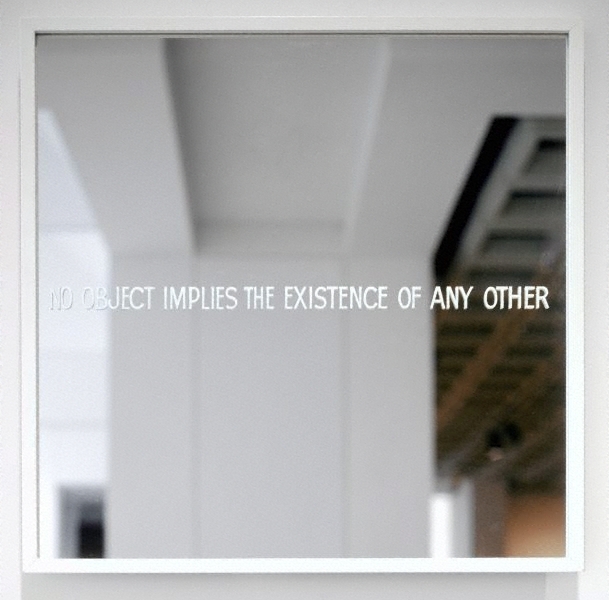 The impossibility of isolating any one thing from all others is emphasised in this conceptual artwork by our reflection in the mirror and that of the space in which it hangs and other art nearby. Signed and dated l.r. verso frame, black marker ".../ IAN BURN...1967". Signed l.r. verso frame, black marker "Ian Burn". Signed u.c. verso frame, pencil "IAN BURN/...". Anthony Bond, Look , 'Landscape not always what it might seem', pg.18-20, Sydney, Nov 2008, 18 (colour illus.). Anthony Bond, Trace, 1st Liverpool Biennale of Contemporary Art , 'Trace: a historical contextualisation of the theme', pg.12-21, Liverpool, 1999, 13 (colour illus. ), 14, 17. Sue Cramer, Less is more: minimal + post-minimal art in Australia , 'Part III: notes on contemporary post-minimalism', pg. 53-69, Bulleen, 2012, 68 (colour illus. ), 87, 113. NOTE: the work catalogued in this publication is not the AGNSW work. It is 'Hume's mirror (No object...)' 1967 courtesy of the Ian Burn Estate. Cherine Fahd, Look , 'The art that made me', pg. 35-37, Sydney, Nov 2016-Dec 2016, 36 (colour illus.). Michael Wardell, Contemporary: Art Gallery of New South Wales Contemporary Collection , 'Ideas and actions', pg.60-107, Sydney, 2006, 68, 69 (illus. ).